One of my favorite chefs, Fabio Viviani, has a monthly recipe challenge that I decided to take part in this past February. His challenge was to create a dish using these 4 ingredients: eggplant, beans, tomatoes & balsalmic vinegar. I had a lot of fun with this challenge and decided to use my hamburger press to create "quinoa cakes." Much to my surprise and delight, Fabio picked my recipe as his favorite and I received his cookbook and a nice personal message from him. Check out his Kitchen Academy blog for amazing ideas and inspiration! Cook quinoa in chicken stock according to directions. Roast baby carrots at 425 degrees for 30-45 minutes or until tender. Preheat oven to 400 degrees. Mash cannellini beans in bowl; add quinoa and rest of incredients. Mix with hands or potato masher until combined. Make patties using hamburger patti press. Bake on lightly oiled baking sheet for 10 minutes on each side. For Eggplant: Toss in olive oil, salt and pepper. Roast at 425 degrees for 30 minutes. For Tomatoes: Toss in olive oil, salt and pepper. Roast at 425 degrees for 30 minutes. 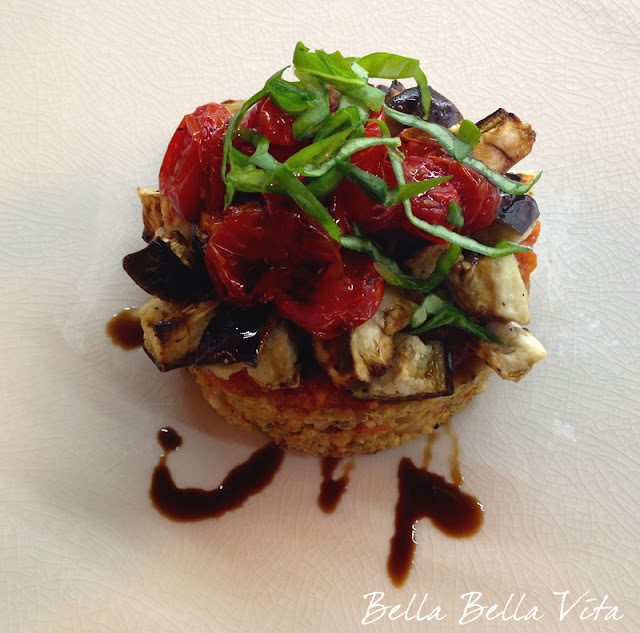 Top quinoa cannellini bean cakes w/ roasted eggplant & tomatoes. Drizzle with balsamic vinegar and fresh basil. I roast all my vegetables in my toaster oven. It's quick and I can set the timer and forget about them!